Boat Blog – let’s get moving! Right, I have a tendency to over plan. Which is no bad thing except that my projects often take a long time to get off the ground – if they ever do. Well with this project I thought that I would just dive straight(ish) in. At the start of this project I had no idea how Remote Controllers work and I thought that the best way to learn would be the buy a basic set-up and play around with it. Hopefully I can hack-it and perhaps use it in the final boat – if not never mind. 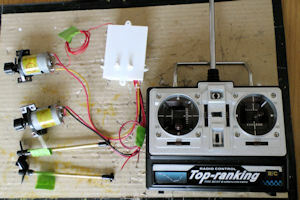 So I browsed a well known auction web site and brought a basic RC set-up for a boat. It costs a shade over £30. 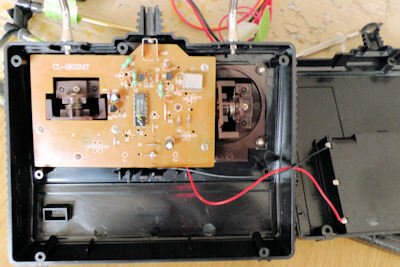 What arrived is as shown in the picture below along with a 7.2V Ni-MH battery pack. Now what I’ve discovered is that there are basically 3 parts, 1) Something that transmits instructions (transmitter), 2) Something that receives the instructions (receiver) and finally the 3) The things that drive & steer the boat. The sophistication of the system is dependent on the number of different instructions that can be sent from the transmitter to control the boat. In technical language the transmitter has a certain degree of freedom, i.e. 2 buttons are 2 doF, and these a assigned to a channel on the receiver. So let’s take a closer look at the transmitter. 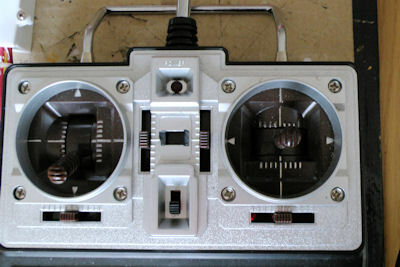 There are 2 joysticks – one goes up-down and one goes left to right. Aside from the on-off switch there are a number of other plastic tabs that appear to be sliding switches. I was a bit perplexed as they didn’t seem to move. Taking the back off it can be seen that oddly they don’t actually move or do anything. They are only for ornamentation! The transmitter uses 8 no. AA batteries (so a nominal 12V) and transmits at 40.680 Mhz – a standard frequency in the UK. .The receiver has 1) An antennae, 2) Motors connections 2 no., 3) An on-off switch, 4) Power input. 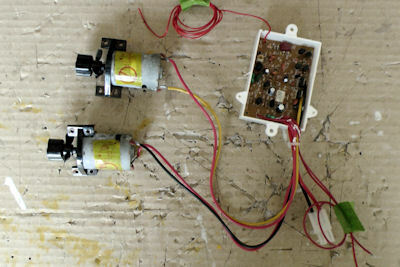 Playing around with the controls – the up-down joystick controls the speed of both motors. The left-right joystick varies the relevant motor speed and thus steers the boat. For example pushing the joystick to the left favors the left motor and steers the boat accordingly. Importantly therefore the motors must be installed the right way around! All that now remains to built a boat, take it for a spin and reflect on what we’ve learnt. I want my boat to be specifically designed to work in a particular environment. 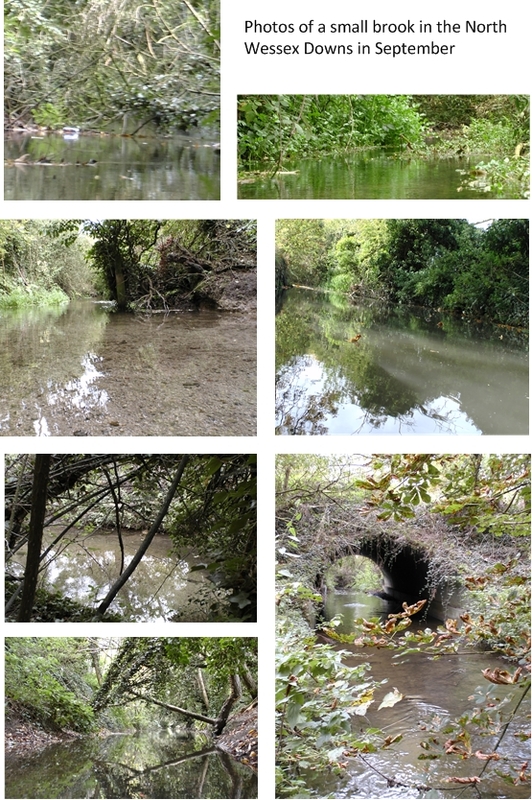 The environment I have in mind are the small streams and brooks of the North Wessex downs. The area is designated as a Area of Outstanding Nature Beauty that is bounded by the Thames in the east but contains a myriad of small brooks. Before I get down to designing the boat I spent a little time getting to know the environment a bit better. The photos paint a thousand words. This brook is about 2-3 m wide in places. Today the water depth along this stretch was about 30 cm in the middle of the steam. However, at the edges gravel-bottomed shallows occur sporadically long the length (September has been very dry). The bottom is often covered in a silt that is easily disturbed turning the clear waters murky in an instant. The banks are often inaccessible and long hanging branches dip into the water. Where the overhead branches clear and sunlight hits the surface plants flourish. The design is starting to take shape. The boat will need to have a broad flat bottom to be able to cope with the shallow water. The above the water there should be nothing that can snag on the branches. The propulsion system needs to be carefully thought through because the slightest wave will send a cloud of muddy silt billowing into the flow and that is not good for measuring water quality. Saving Energy – Part 1. However you don’t need gadgets to save money & energy (and thus reduce climate change). 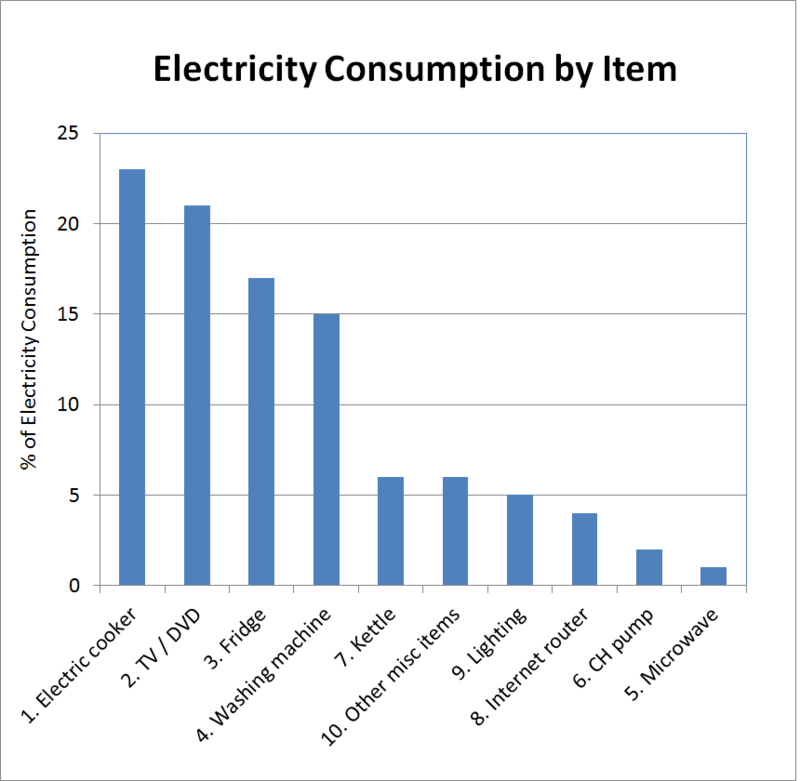 I thought I would share my experiences of saving energy in my home over a couple of blog posts. Share some of my light bulb moments, if you’ll excuse the pun. I take an electricity and gas meter reading at the same time each week. I do this on Sunday at about 7 o’clock as I am usually at home at this time. I record this in a spreadsheet and create a graph of how much energy I use each week. It is important to take it at about the same time (without being too obsessive!) to make it easier to compare how your consumption changes over time. A snip of my spreadsheet is shown below. You can see when I went on holiday and when I switched by gas central heating on! Your your energy use does vary a bit week by week. In winter energy use can go up as the central heating is on and we spend more time at home. Ideally it would be good to monitor energy use before you start saving so you know how much you have saved – you might consider it a little odd, however, to continue to waste energy! – Your call. Step No 2. Turn off all the things that don’t need to be on! More about this in the next blog.